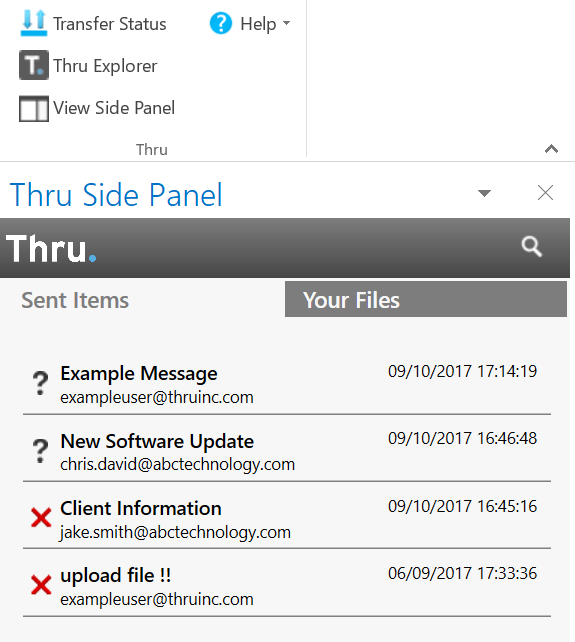 Thru Side Panel is a tool within the Thru Add-In for Outlook for users to add, manage and download content from their Thru file system without leaving Outlook. Note: This feature is only available in Outlook 2013 and above. The side panel contains two tabs, Sent Items and Your Files, where users can view transactions sent with their Thru account and navigate their Thru file system. This section of the Add-In for Outlook User Guide will demonstrate the different actions that can be performed using Thru Side Panel.